Young women on the fringe of adolescence and adulthood populate works of classical literature and commercial fiction in droves. 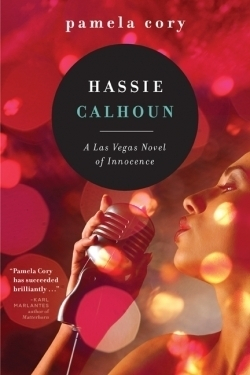 In Hassie Calhoun, the first book of a trilogy, this popular transitional period is explored in a gripping story about an aspiring singer in 1960s Las Vegas. Categorized as a modern bildungsroman by the publisher, this poignant novel is a down-to-earth rather than idealistic glimpse of a vulnerable heroine learning how to succeed…and unfortunately, how to stop trusting people. Hassie leaves home while still a teenager in rural Texas, seeking excitement and contentment. By establishing a prosperous career rather than searching for fulfillment in a domestic realm, she knows she will make her mark on the world and achieve happiness. Her innocent endeavor is thwarted by her dangerous affiliation with Jake Contrata, a volatile man who propels much of the action and controls her life. Though a depressing, abusive relationship may not be the best ground on which to open a story, Cory’s intriguing page-turner is an exception. Hassie’s passionate, though damaging, interaction with this fictional manager of the Sands Hotel leads to a sequence of ominous encounters. Complicating the unhealthy situation is her intermittent contact with Frank Sinatra, a lifelike portrayal of a mesmerizing celebrity that earns the author well-deserved commendation. This ghost from the annals of Vegas history adds an appealing touch of authenticity to the novel. Despite Sinatra’s fame, he fails to overshadow Jake’s dominant presence in the plot or in Hassie’s psyche. As is typical of mistreated women, she retreats to the bad boy’s arms for irrational reasons. Guided by financial and emotional need, Hassie’s continued interaction with Jake takes one ugly spin after another as his skilled manipulation keeps her dependent, succumbing to his advances in a misguided attempt to sustain herself in an aggressive business. Depicted with realism and tenderness, this exceptional protagonist should enchant readers in NYC and London in the second and third installments of this series. A native of Charlotte, North Carolina, Pamela Cory holds a degree in music and relied heavily on her fifteen years in the entertainment industry to write Hassie Calhoun. She lives in New York City and Dubai.